The Orphans of the Storm® Annual Benefit Dinner is just over a week away–April 28 at 5 p.m.! Help support a great cause that helps these great dogs (and cats!) find their new happy homes. Even if you can’t make it to the dinner itself, you can still donate items to the silent auction. 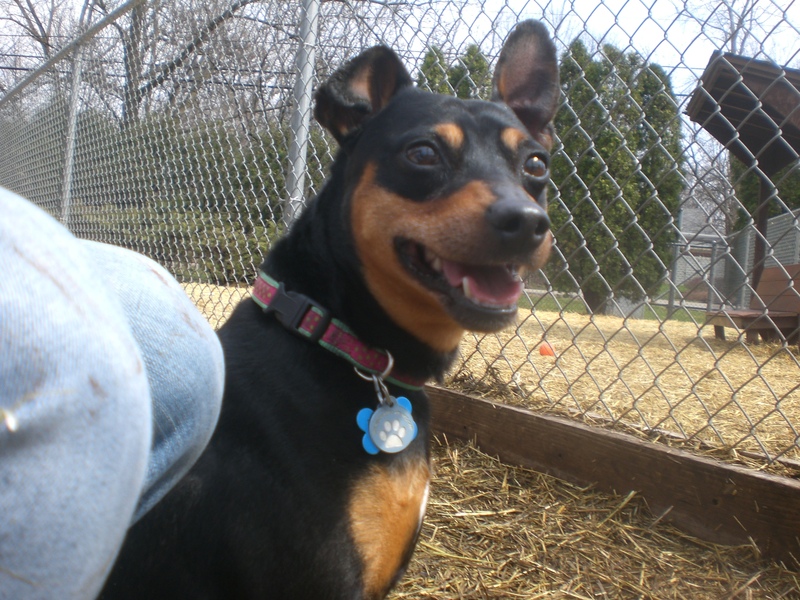 Nano the eight-year-old Miniature Pinscher mix is a lap dog if I ever did see one. As soon as we were in the off-leash run, Nano was jumping up and down and tried to climb into my lap as soon as I started to kneel down next to him. When I sat down on the bench, Nano was up there next to me in a flash and kept trying to burrow into my lap, as if he couldn’t get close enough. He loves to give doggy kisses and does the cutest little doggy dance when you scratch his hips. Nano may love to snuggle, but he also has plenty of energy. 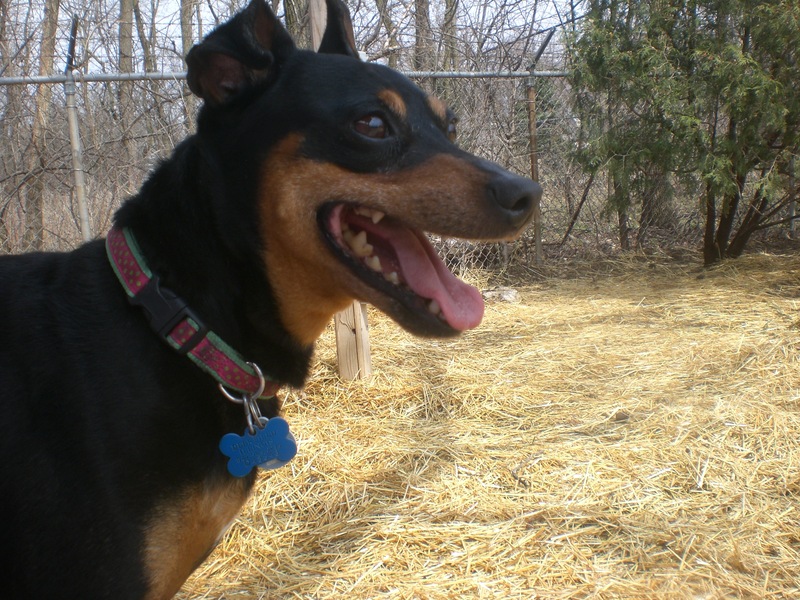 I think I’ve said this about most of the Miniature Pinschers I’ve met at the shelter: those little legs can really move! Nano is no exception. He was interested in chasing down any toy I threw, though he hasn’t mastered the “fetching” part yet (he’d just sniff the toy where it landed and that was that). Little Nano will make a fun addition to any home, so come in soon to meet him! 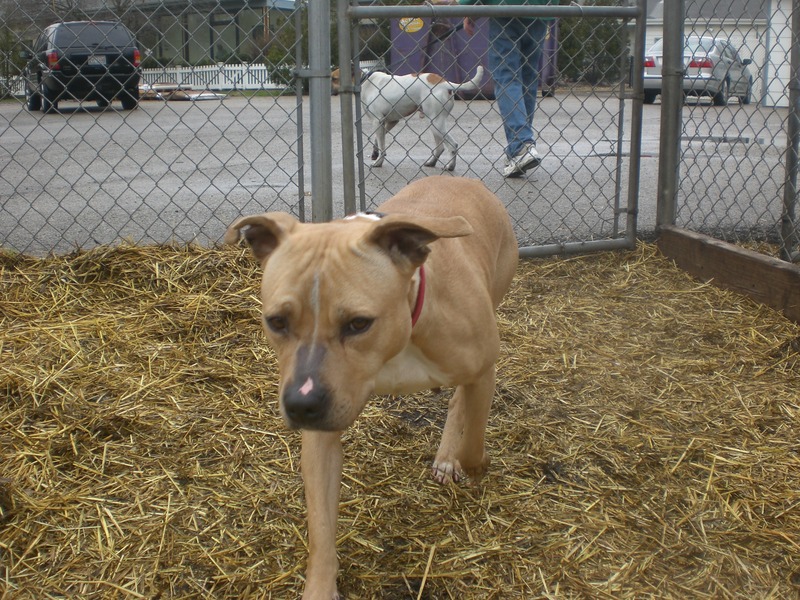 Sweet Pea the three-year-old Pit Bull Terrier mix certainly has the right name to match her personality. 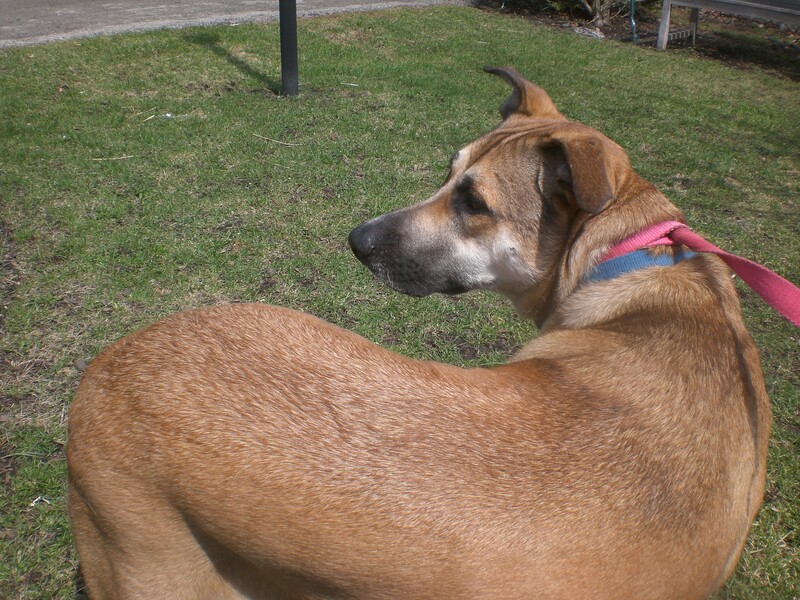 This darling girl gets along with everybody–adults, kids, other dogs, you name it. She walked pretty well on the leash as we made our way to the off-leash run and gave a friendly hello sniff to Corky, who was on the other side of the fence, before going off to explore. 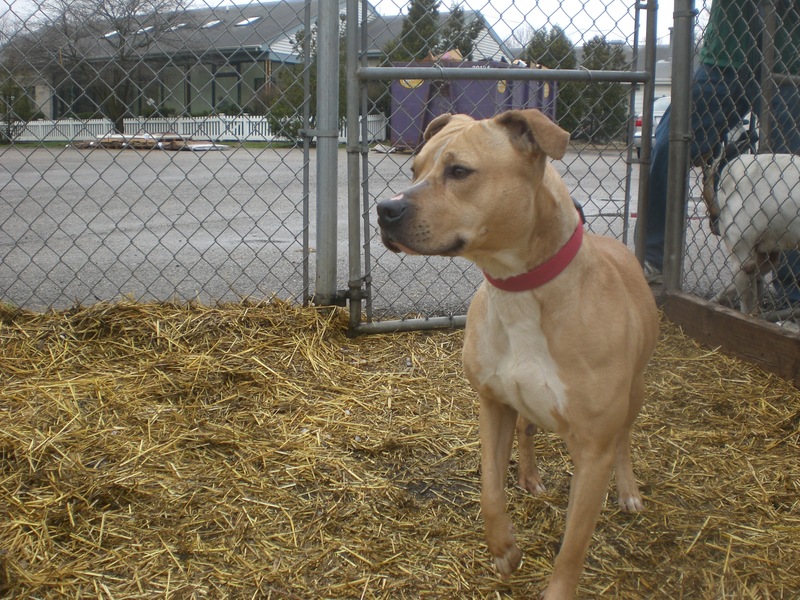 Sweet Pea is a smart girl who would probably respond well to training to learn some new tricks. She even went over the agility bridge with just a little bit of encouragement! Sweet Pea also likes to keep an eye on things and greet anyone who comes over. She put her front paws up on the gate of the off-leash run to watch what was happening on the other side of the fence, and her tail would start wagging whenever someone walked her way. This sweetie is ready for her forever home! Could it be with you? 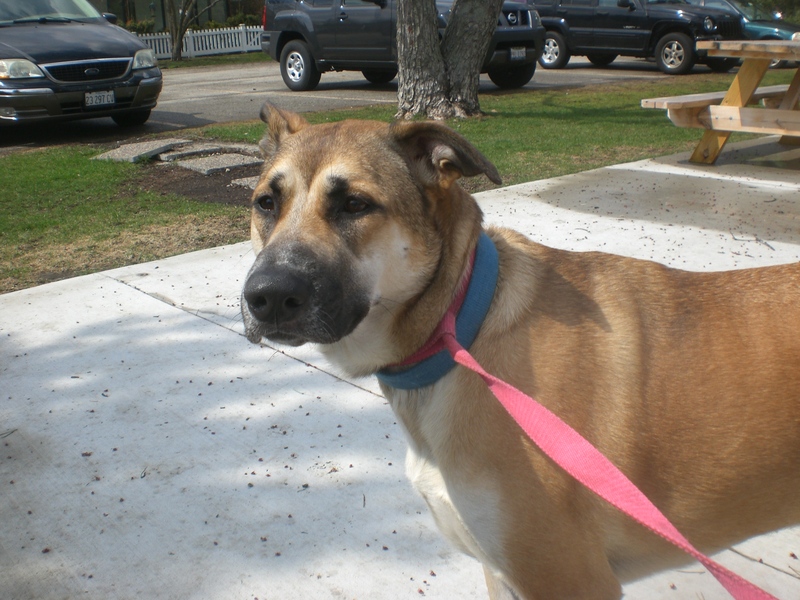 Alice the two-year-old German Shepherd mix was feeling very shy at the shelter when I met her because she had just been turned in by her owner, who could no longer care for her. She was a little hesitant about coming out for a walk, but after just a few minutes of quietly strolling around, she started to warm up to me. Alice is clearly a sweet, gentle soul. She walked well on the leash, and would come and stand next to me so I could scratch her chin, which she seemed to enjoy. Those brown eyes will make you fall in love with her right away! She’s sad about losing her first home, but she will make a wonderful companion to her new family. On your next visit to the shelter, be sure to say hi to Alice! Tom-Tom the nine-year-old Pit Bull Terrier mix has one of those faces that immediately makes you smile because it is just so cute (and so big!). Tom-Tom is a strong boy, but for the most part he was good at walking on the leash. 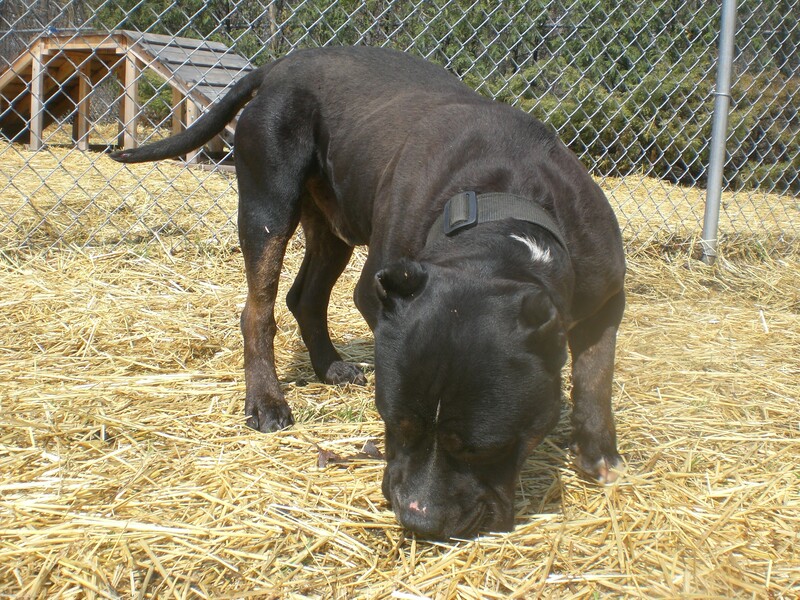 He’s also a polite pooch–he walked right through the middle of a group of kids who were visiting the shelter and just gave a quick sniff here and there before continuing on. Tom-Tom is very attentive to what people want. When we were in the off-leash run, the dog in the run next door was barking at Tom-Tom. Rather than barking back, Tom-Tom looked up at me like, “What should I do about this?” I told him to come over by me, and he did just that. Then he gave me a couple of doggy kisses. What a cutie! 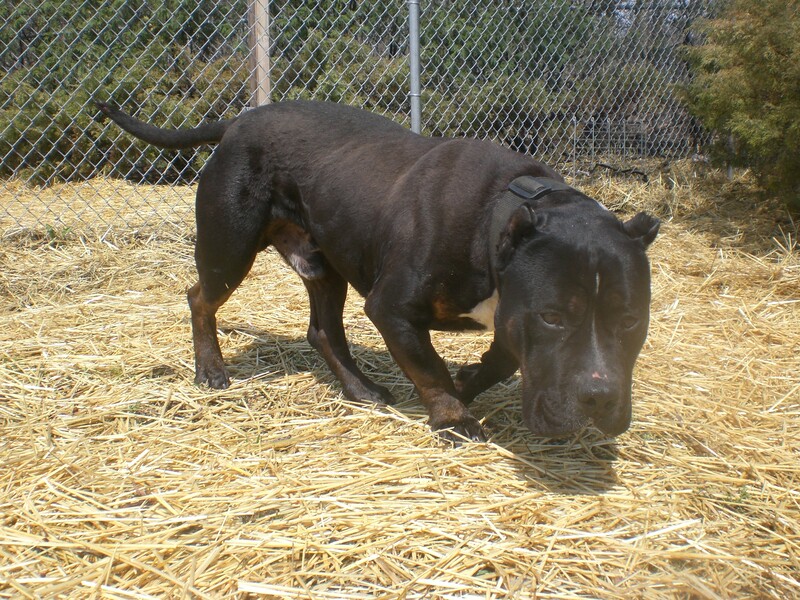 If you’re looking for a big boy to be your new companion, come in soon to meet Tom-Tom. I also saw my furry friends Tiger (who is also friendly with dogs and kids), Javan, Molly, the other Molly (who is still the best fetch-player you’re ever going to find), Dezzie, Duke (yet another dog who gets along with everybody and everything, including cats! ), Giorgio, Jade, Saber, and Lucky. Even if you can’t adopt right now, there’s another great way to help: Orphans of the Storm® is looking for volunteer dog walkers to give the pooches some exercise now that the weather is nicer. There is a handling class on May 14 if you’re interested! Posted by Meet the Pooches on April 17, 2014 in Dog Profiles and tagged adoption, animal shelter, animals, Chicago, dog walking, dogs, German Shepherd, Miniature Pinscher, Orphans of the Storm, pets, Pit Bull Terrier.